Can I train my deaf dog? (Q) I have an eight-year-old Lurcher who is deaf. Do you have any tips for walking and basic training in the house for a deaf dog? He was a rescue dog and was left to his own devices by his past owners. (A) Trainer Elizabeth Kershaw says: I suggest that you get hold of the book ‘Hear, Hear' by Barry Eaton. Barry has had a depth of experience with deaf dogs and passes on many valuable tips and advice for owners struggling with this problem. Teach your dog that a light touch on his body means that it is in his best interests to turn to you for a food treat or game. Having reliably got his attention you can then easily teach simple basic commands such as sit, down, and come using lure and reward methods. I suggest that you introduce the principles of clicker training into your training by using a behavioural marker. 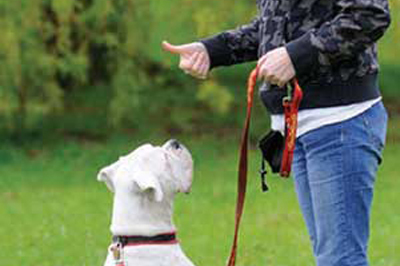 Unless your dog has some residual hearing, he may well not hear a sound-related behavioural marker such as a clicker, but it is not difficult to substitute a hand signal for this purpose. Hand signals rather than verbal signals can also be used as cues. What you need to plan in advance is which signals to use for each behaviour and write them down so that you don't inadvertently use the wrong ones. Dogs do not find it difficult to learn visual signals. Body language is their primary form of communication. Outside life is more difficult and you need to make decisions based on your dog's natural behaviour. A dog who is closely bonded may well be used to frequently checking back with you on a walk, and it is not difficult with such a dog to communicate that signals learned elsewhere at close quarters also apply in the open air. However, as a Lurcher he may have other instincts which conflict with this and you may have to decide that you can only allow walks on a long line unless you are in a totally fenced area. Launched in 2011, the Deaf Dog Network (DDN) is made up of a group of people who want to help deaf dogs and share their knowledge and advice on the subject. The organisation offers advice and support to people who own or work with deaf dogs, and raises awareness that deaf dogs can lead normal lives and make great pets. Co-founder Karen Lawe, a trainer who got the idea for the DDN through her work as a deaf dog foster carer for rescue charities, won the Dog's Best Friend award at last year's Dogs Trust Honours Awards, in recognition of her hard work and dedication to the DDN.